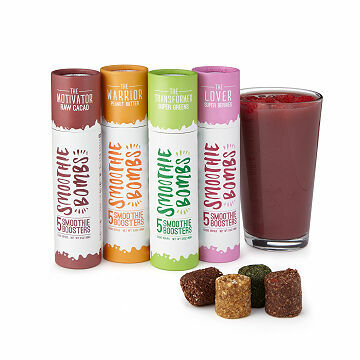 These compact "bombs" add flavor and nutrition to otherwise simple smoothie recipes. Just think: With as little as a blender, a banana, and the milk of your choice, you could be well on your way to a lush, healthy smoothie. What's the secret? A smoothie bomb. Simply crumble one up, add it to your fruit-and-milk mixture, and blend. Despite its diminutive size, each "bomb" is packed with ultra-healthy components that boost flavor, too. (Think organic spirulina, organic raw cacao, or organic goji berries.) Made from whole ingredients, they're available in four gluten-free, vegan-friendly flavors. Each tube includes five "bombs" of the same flavor wrapped in eco-friendly packaging made from plants, not plastic. Made in Australia. Contains tree nuts. Manufactured in a facility that also processes soy, milk, and eggs. I love these! The greens are my favorite. Really tasty and easy to use! I look forward to them every day! Nutritious and so simple!! Highly recommend. Great product! I travel with a portable blender, and don't want to sacrifice healthy eating (like my morning smoothie). I am a little disappointed by the taste, super bland. I used the berry one with banana and some blueberries with vanilla almond milk. I will keep trying a few different options and try to get my money's worth in my purchase before giving up completely. The convenience of this product was by far the selling point, though I still need to pack protein.